Is China in a middle-income trap? It’s easy to forget China is still a (upper) middle-income country. Considering a middle-income trap as the concurrent decline of productivity (as gains from technology adoption end) and increasing wages (as reallocation from low productivity sectors exhausts the excess labour supply) a negative value of an indicator measuring the growth of total factor productivity (TFP) and wages could indicate a middle-income trap. What defines the trap is the erosion of competitiveness such that the economy fails to grow by investing in advanced infrastructure, stimulating innovation and improving labour reallocation between sectors – three policy options that improve TFP. Thus even if the indicator is negative, the size of the economy (that is, the proportion of wages in GDP) may still contribute to continuing growth as foreign debt may still finance necessary investment. Furthermore, as Nobel laureate Paul Romer envisages, a larger economy implies a broader possibility of mobilising intangible assets such as human capital to innovation. 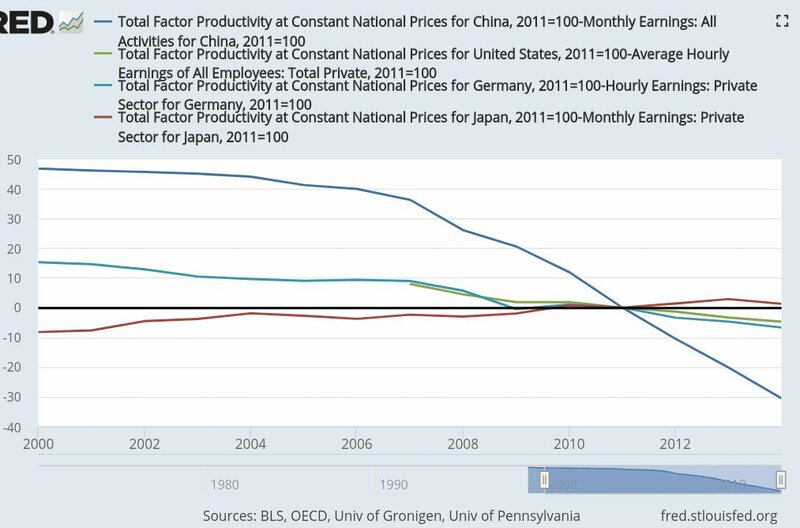 The chart below plots the difference between the level of productivity and the the level of wages indexed to 2011 in China, the United States, Germany and Japan. 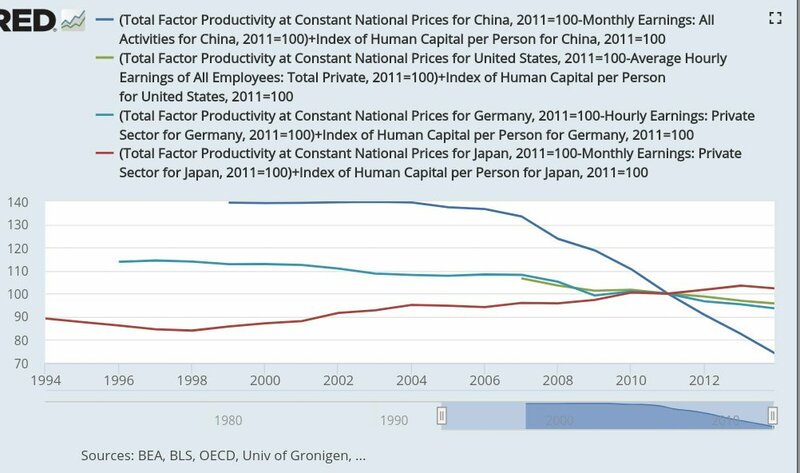 The different development stages (China’s middle-income and the other three economies high income) is visible in the wide gap between productivity and wages in China compared with the other three. As labour excess supply began to shrink in 2004, the gap veered downwards and is now negative, indicating exhausted competitiveness. Accounting for the effect of accumulated knowledge as foreseen by Romer and Rivera-Batiz is insufficient to break the decelerating growth trend in China. Thanks – Enjoyed this update, how can I make is so that I get an alert email every time you publish a fresh update? Thank you for positive feedback – you can subscribe through the WordPress app, do you use it? Thank you for positive feedback – you can subscribe through an account at WordPress. When logged in to WordPress an add button appears when you visit the blog ; you may configure whether WordPress sends a weekly or daily email in settings.